like the stars that were no longer there. they were funerary offers to a dead world. When did it start? When they left us? on the last beach, sand on the edge of some hell. in the darkness, riding at anchor. gasping out its last light before falling to ash. I hold in my pocket. all the world is doomed. not sure I want to wake. Ayo Khensu-Ra’s Ilium will be published in our Spring 2013 issue. that she was bored by them. in its conversion to sound. C. S. Hall’s Incomplete Sentences will be published in our Spring 2013 issue. Following in the spirit of Forum‘s recent publication party—which, if you missed, was a great success and a lot of fun—we are hosting a second open mic and reading this semester, this time at the ever-excellent Cafe La Boheme. 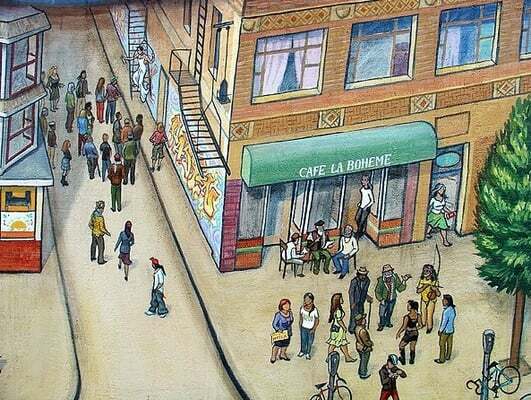 Located next door to the 24th Street BART station, Cafe La Boheme is not only easy to get to but also serves as a dependable locale for finding good food, drink and conversation—and, in the case of this upcoming Sunday, a chance to hear the latest literary works of the CCSF community as well. So whether you have some new or old work you would like to read, you’d like to hear some great stories and poetry, or you’re simply looking for something to do Sunday night, come on out and enjoy the festivities! Here is a preview of Jordy Lynch’s Holding Up the Circle, which will be published in our Spring 2013 issue. Jordy read the piece at the release party for Forum‘s Fall 2012 issue, video from which can be viewed below. Clouds spread out across the sky, covering any blue the atmosphere usually reflected, resulting in a range of dark and light grey. The mottled sky peaked through treetops and around rooftops. I was walking to the lake, the usual sounds of gunfire absent today. The gun range across the lake was only open on Wednesdays and Sundays. I think it was a Tuesday. I always wondered why the lake in the city would have a gun range attached to it, but the lake absorbed any missed rounds. Plus the water acted as an excellent surface for the gunshot reports to travel on, and I enjoyed the periodic noise of the firing range. Seth Luther is the managing editor this semester for Forum Magazine. He is currently reading Kobo Abe. He also likes very much Kafka and Vonnegut. He is also the mastermind behind Magicwear Manwear Underwear: a manufacturer of manly magical underwear designed specifically for men who are magicians. His efficiency studio apartment receives no light causing mold to grow on his face instead of facial hair.